This is my first review ever, on any site, so I hope I do a decent job. And speaking of a decent job, Justin Gray and Jimmy Palmiotti do a fine job with this first book of the 2006 series centered on the Old West bounty hunter, Jonah Hex. 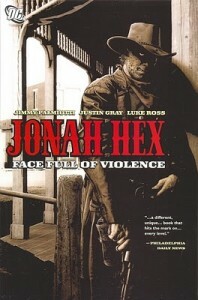 This book contains issues 1-6 of the 2006 Jonah Hex ongoing, each containing a self-sustained story. In addition, the issues are broken down into individual chapters. The story lines may be on the short side, but they are each full of good old fashioned western excitement. It starts off with a bang, literally. “A Cemetery Without Crosses” gives readers new to the character some insight into how Jonah thinks and behaves. We then follow Hex two weeks later to the main storyline for that issue. There, we learn that Hex, while rough and tough on the outside, may have a soft heart after all. The second story, “Dia de los Santos Reyes,” is strategically placed, as it tends to conflict with the softer side of Jonah that we see at the end of the first issue, thus giving the reader the full breadth of the conflict within the main character. This is a common theme in the post 1950’s western films as well, where the hero struggles with his role and is often the anti-hero. Issue three, “The Slaughter at Two Pines,” is probably my favorite of the six, as it contains a nice cameo by another western character well known to DC fans, Bat Lash. It is in this issue that the comparisons between Jonah Hex and Batman seem to flourish. Both characters are loners and prefer to work alone, however, as this issue shows, there are times when one needs to call in the cavalry. Jonah and Batman both struggle with their hard cold exterior, perhaps Batman more so. Both men walk a fine line in their work, and both men are criticized by their companions for coming too close to crossing that line. The fourth issue continues with the above themes and fits in nicely after the Bat Lash issue, as we once again see that Jonah Hex is really a solitary hero. “Chako Must Die” starts off with Hex being his usual cold-hearted self, but by the end, we see he does have a sense for what should and should not be. “Christmas with the Outlaws” is the next story and it is anything but typical. First and foremost, the art is done by Tony Dezuniga, the co-creator of Jonah Hex. His artwork stands in stark contrast to the fluid style of Luke Ross, with rough drawings and a more grotesque look to Jonah. Dezuniga’s style leaves a little bit of a different feel to the story. You really get the idea that Hex is forced to walk alone. “Christmas” takes place over a ten year period and shows an almost diabolical side to Jonah that we don’t get to see in the previous issues. Finally, closing out the book we have “The Plague of Salvation.” It is in this issue that we learn that Jonah does indeed have a past and that past carries a heavy burden. We also see that he is not without his weaknesses. The story does well as a closing to the book and leaves the reader wanting to continue reading about this mysterious bounty hunter. But Ross, who is also known for his work with Green Lantern, does a great job detailing not only the characters but the surrounding scenery as well. As with any good western story, the scenery almost takes on a character all its own and plays a big part in the development of the storylines. 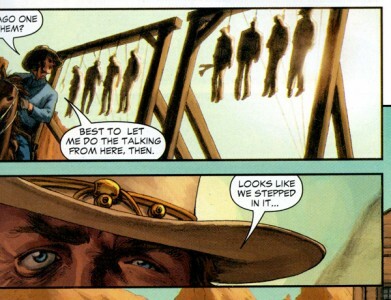 This was my initial introduction to Jonah Hex and the 2006 run. I am told that I can expect the remaining run to be similar in that each issue does indeed stand on its own. This style fits in well with the 1960’s view of the gunslinger, but I for one would love a six issue plot line. This book is highly recommended, but be forewarned. Jonah is not afraid to draw first blood, so there are some scenes that may turn some readers off with their violent depictions. All in all, I felt it was done properly – not wasted or wanton violence, like you might read in the Punisher MAX series, but rather purposeful and reasoned action. It is necessary to show that for Jonah, the end always justifies the means. If you enjoy Western stories half as much as I do, then you’ll be glad you picked up this book. A great new start to a great old character. I give this book a strong 4 1/2 stars out of 5. The sole reason for not getting a full 5 star rating is that I would have liked to have seen more of a connection in the plot lines from issue to issue. I do not consider this essential to understanding the character as a whole, but it is important to see where Jimmy Palmiotti is going to take Jonah Hex and the individual stories. It serves well as a bridge from the classic stories to the current run. If you need some history, then Showcase Presents: Jonah Hex Vol. 1 is a good way to go. Otherwise, you can pick this book up without reading anything else prior to it. 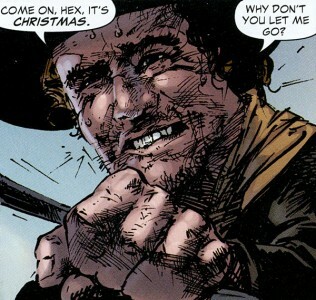 Jonah Hex: Guns of Vengeance, which collects issues #7-#12. Really great review, Brian! I hope you like the pictures I chose to go with – I tried to get high resolution scans of images that fit what you were describing and still worked in our layout. I liked your choices, but a couple were hard to get working right. That first one is excellent. Anyway, I really think this sums up the book nicely. Looking forward to reading your next one! Thanks a lot, Ian. I almost enjoyed writing this as much as I did reading the book! This book really led me to want to read more about different DC characters, separate from the usual JLA scenario that I’ve grown so used to. I am looking forward to my next read, as The Viking Prince just arrived the other day. I’ll be using that as my starting point for my timeline reading. Thanks again for the opportunity to write about this book. The new hardback? Very cool. I’ve got that one and have been looking forward to getting into it. I just found the three modern Sgt. Rock trades for a good price and am looking forward to those as well. There’s definitely a lot to find around the fringes of the dcu! woo! Just read the first two pages of this book and had to drop in to say I’m pretty damn psyched. I think it’s a welcome return to the Hex I love. I’ll pop in again once I’ve finished it with a couple thoughts. haha excellent fun. I have to admit my favorite issue was the Bat Lash one, I’m a sucker for a cameo.